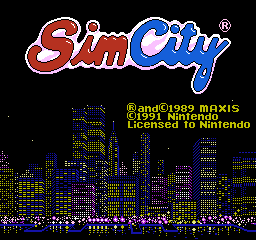 The NES SimCity was in development alongside the SNES version, progressing far enough to be shown off in a playable form at the Winter 1991 Consumer Electronics Show. It was cancelled soon afterward in favor of focusing on the SNES version and was thought to be lost forever until a prototype cartridge surfaced at the 2017 Portland Retro Gaming Expo, which was dumped a year later. Open any message window (disasters, hints, information, etc.). Press and hold any combination of all four D-Pad buttons on Controllers 1 and 2 (e.g. Up + Left on Controller 1 and Down + Right on Controller 2) as well as A + B on Controller 2. Release all of the above buttons. Press and hold the same D-Pad buttons on Controllers 1 and 2 (e.g. Right on Controller 1 and Right on Controller 2). Press any other D-Pad button on Controller 1. Press A or B on Controller 1 to exit the window. All buildings and zones can be built on top of each other. Four unused animations for Dr. Wright exist in the ROM. All four were used in the SNES version. This page was last modified on 1 February 2019, at 08:35.